Recently I attended a conference that focused on marketing to affluent consumers. As I listened to a day’s worth of presentations, I realized that the speakers were using the market descriptors “affluent,” “wealthy,” and “luxury” interchangeably. However, based on the work we have done in these three market segments, we must note that while they overlap somewhat, the three categories relate in most respects to consumers with different demographic and behavioral profiles. As found in our ongoing survey and recent U.S. Bureau of the Census statistics, we estimate that these three market segments encompass about 47% of all adults 18 or older, or about 114 million adults, as shown below. About 72 million, or 29% of all adults, are categorized as affluent when marketers use $100,000 household income as their minimum targeting criterion. However, when marketers are targeting wealthy consumers and use $1 million in personal liquid assets as their minimum criterion, the number is materially lower, at about 19 million or about 8% of all adults. For marketers targeting luxury consumers (those who buy luxury products and services), about 67 million adults qualify, but many of them are neither affluent (only about 43% of them) nor wealthy (only about 17%). For marketers targeting very upscale consumers — the trifecta of those who are affluent and wealthy and luxury buyers — our current estimate is that only 7 million adults (about 3%) make it into this elite segment. 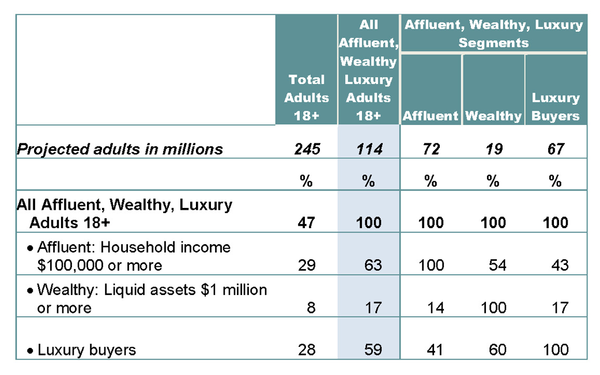 When we focus on these three market segments by their household income, it is notable that the majority of luxury buyers (57%) are not affluent, assuming $100,000 household income as the minimum income level. Also notable are the percentages of the wealthy whose income is either below $100,000 (46%) or in the higher ranges of $250,000 or more (16%) and $500,000 or more (5%). 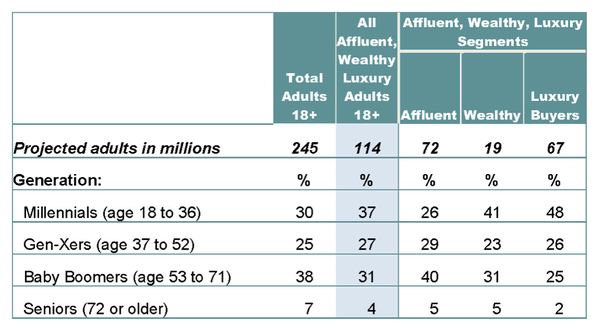 As expected, all three of these upscale market segments are wealthier than the average American adult. 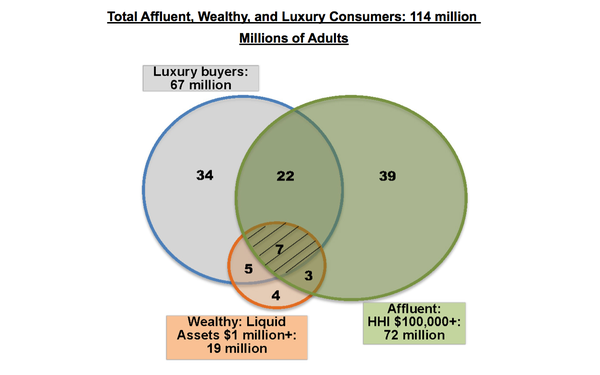 Notable is the proportion of the wealthy whose personal liquid assets exceed $5 million (24%). 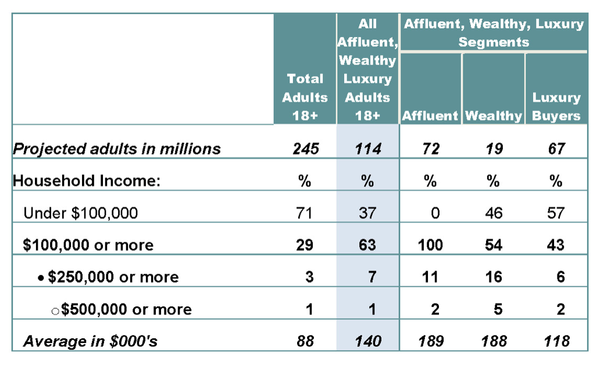 Finally, regarding the three segments’ generational memberships, the affluent are more likely to be Boomers, while the wealthy and luxury buyers are more likely to be Millennials. To paraphrase the headline of this column, we have found that all affluent, wealthy, and luxury consumers are simply not the same. 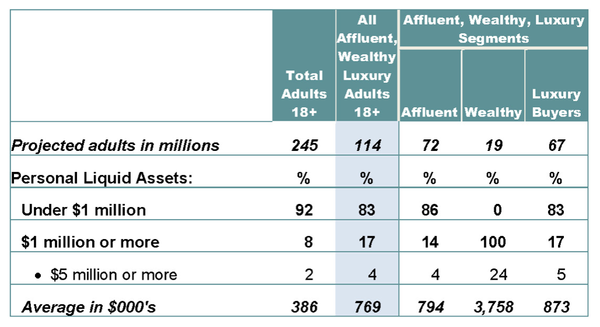 1 comment about "All Affluent, Wealthy, And Luxury Consumers Are Not The Same". Ron Kurtz from American Affluence Research Center, June 19, 2017 at 4:58 p.m.
Would love to see Mr. Shullman compare or relate his numbers to the data of the Federal Reserve Board Survey of Consumer Finances, which seems to be the best research on the distribution of wealth in the U.S.